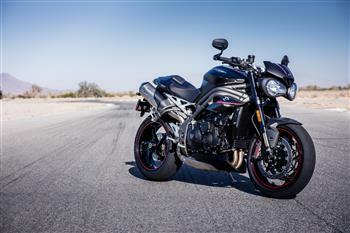 ALL NEW TRIUMPH SPEED TRIPLE MODELS UNVEILED. Triumph launches Special Edition versions of the Bonneville and Speed Triple. Bonneville SE changes include a head turning red frame, a distinctive new paint scheme, new headlight mounts and a black pillion grab rail. May 2012 sees a host of bold new colours, style motifs and improved aesthetics across Triumph's model range, as the UK's number one 'big' bike (500+cc) manufacturer continues to delight riders with contemporary upgrades and model improvements.